Spanish teenager Francesc 'Cesc' Fabregas signed for Arsenal in August 2003 from Barcelona, and made history just a couple of months later. In October that year, Fabregas made his debut for the Gunners in the Carling Cup tie against Rotherham United at the tender age of 16 years and 177 days, making him the youngest person ever to play for Arsenal. He set another record in his second ever appearance against Wolverhampton Wanderers as his goal in that match made him the club's youngest-ever goal scorer. As well as making such a big impact on his new club, Fabregas was also gaining international experience in the Under-18s World Cup, being named Player of the Tournament and winning the Golden Boot. If the 2003/04 season had given glimpses of his talent, an injury to Patrick Vieira at the start of 2004/05 gave the young Spaniard his chance to really shine and he certainly took it. He showed no signs of nerves against Man United in the Community Shield and went from strength to strength in the opening games of the league season. He scored his first Premiership goal against Blackburn, aged 17, and has continued the steady ascent becoming a regular fixture in the team in the absence of more senior players. He made 45 appearances all in all, scoring two more goals along the way against Rosenborg in the Champions League and Liverpool in the Barclays Premiership. 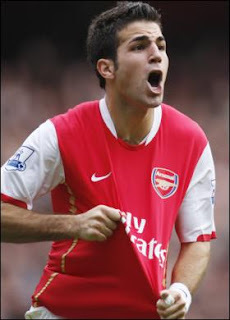 In September 2004, Fabregas signed a new, long-term deal with the Gunners, with Arsene Wenger citing the youngster as "very much a part of the future of the club". In the 05/06 season, Fabregas delivered on his manager's promise by slipping into the midfield role Patrick Viera departed in summer 2005 with consummate ease. He was arguably the Gunners' player of the season and made 49 appearances all in all, scoring four goals. His commanding performances in the Champions' League against Real Madrid and Juventus helped Arsenal reach the final of the competition and quickly endeared him to the hearts of the Highbury faithful. He also played a small part in Spain's World Cup 2006 bid which ended disappointingly in defeat to France in the second round. Things got better in the 2006/07 season as he played nearly 50 games for Arsenal, scoring four goals along the way. He was nominated for the PFA Player Of The Year and PFA Young Player Of The Year, but was beaten on both counts by Cristiano Ronaldo. With Thierry Henry leaving for Barca at the end of that season, Fabregas took over as the superstar of the Arsenal team in 2007/08. He was once again one of Arsene Wenger's most skilful and valued players, and although he ended the term trophyless again, it was an undoubtedly successful term.